The Cold War ended years ago, or did it? For Thurmond Giles, a decorated African American Air Force veteran found naked, dead, and dangling by his ankles inside a deactivated minuteman missile silo in desolate southeastern Wyoming, the answer is no. The labyrinthine investigation that follows his death--led by former fighter pilot Major Bernadette Cameron and ex-college baseball phenom-turned-reporter Elgin "Cozy" Coseia--reveals how the atomic era's legacy has continued to destroy both minds and lives. 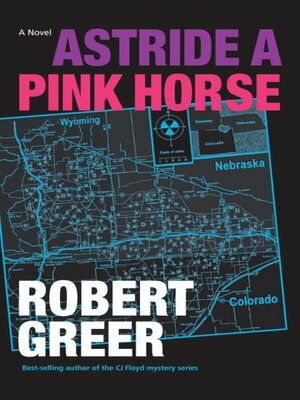 Astride a Pink Horse follows Bernadette, Cozy, and Cozy's boss Freddie Dames match wits with a gallery of unforgettable murder suspects: a powerful, right-wing-leaning cattle rancher; a declining seventy-six-year-old WWII-era Japanese internment camp victim and her unstable math professor cousin; an idealistic lifelong nuclear arms protestor; and a civilian Air Force contractor with a twenty-year grudge against the murder victim. Do three amateur detectives stand a chance against these characters and the conspiracy that may be behind it all? Robert Greer's trademark mix of vivid eccentrics, surprising plot twists, and political edge makes this one of his most memorable thrillers.